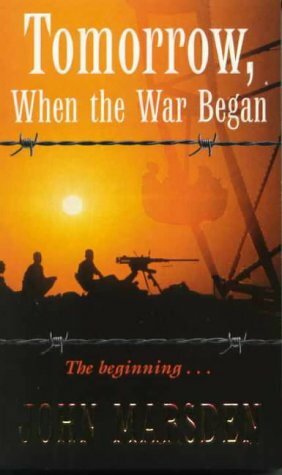 Last night I went and saw the film version of one of my favourite books, Tomorrow, When the War Began. Normally I shy away from movie versions of books as they are never quite as good as the book, and when it's a book that I really love, I'm even more reluctant. But I'm happy to say that I really enjoyed the movie. It was very faithful to the book, and the few things that were different were not to any detriment of the story. The special effects and explosions were top class! I was very impressed. I think the thing that worked for me was that I had low expectations of the film. I wasn't expecting it to be anywhere near as good as the book so I was happily surprised when I found I liked it. I definitely want to get it on DVD. And I hope they make a few more. The one thing that was slightly off-putting though was the actor's accents (the acting was not too bad, but let's just say they're not gonna be nominated for Oscars! But who cares, they gave it their all). The most Aussie sounding ones were Lincoln Lewis and the guy that played Lee, the Vietnamese kid! But it was only bad when they were in action, yelling or screaming, I suppose it's harder to remember your diction when your supposed to be fighting for your life! Lol! As a fan of the book, I think they did as good a job as you can ever do turning a book into a movie. All in all it was a pretty good movie, not too long, a great way to kill almost 2 hours, and I think even if you haven't read the book, you should definitely give it a look. I'm so glad to read this! I have been wanting to see it, but unsure about whether I should and hubs and I are going to go this weekend when the kiddos are with Nanna - so it's a relief to hear that someone has enjoyed it AND the books. I was worried about the accents of the actors they chose and I will try to let it not annoy me!